As most of you know, I have been struggling for well over a year now to learn to make mesh models. I spent a good deal of time messing about with Sketchup, which is easy and intuitive, but learned in quick order that it is not acceptable for SL Grid love because it is messy mesh and is the chosen tool of the devil. So…despite my best efforts to avoid it, Blender it would have to be. Like most people, such as myself, that have no experience and very little time to hone such a skill, Blender can be a nightmare and lets face it, to the experienced, the GUI alone is fright inducing. To date, I have managed to watch a few beginner tutorials on Youtube enough times that I was able to produce a poorly modeled coffee mug and a tufted cushion. Yay. There are some great tutorials out there, but very few of them move at a pace or provide enough detail to develop a true understanding of the interface or what those gazillion buttons do, mean, or where they are hidden. I must say that to call them “books” may be a bit of a misnomer. 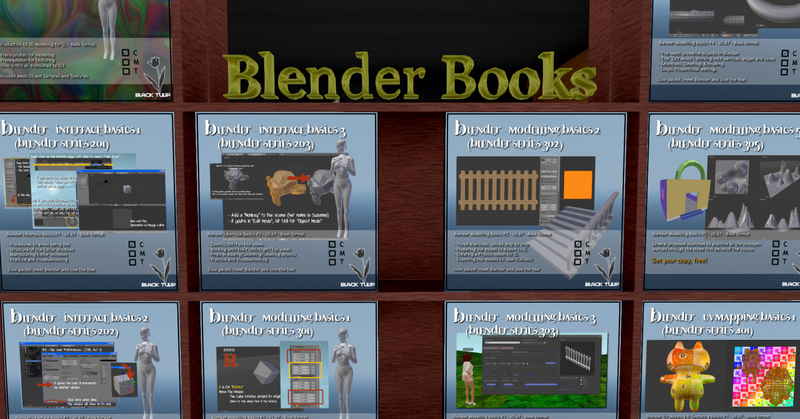 What they are is amazingly detailed presentations with explanations of everything you NEED to know just to navigate Blender. Details that are so often left out of videos, like how to get back to your screen if you accidently change view or mode, and how to bring up menus, that seem to just be there in videos but not on your screen…been there too many times to count, are all clearly explained. The series of books takes you from the beginning to the most challenging part, texturing your creation! While you will not be in expert at Blender after an hour, you will save yourself valuable time and have a handy reference that you can virtually flip through at whim. I highly recommend a trip to the store if you are a new builder. 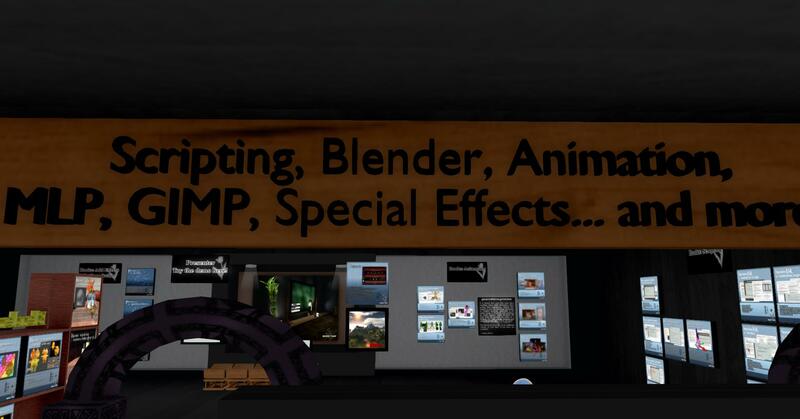 There are tons of learning materials and useful tools for new as well as established builders…Scripts, scripting, GIMP, Animation tutes, poses, and some nice mesh models are just a few of the items you will find at Black Tulip!